PaintScratch.com sells the highest quality Volkswagen paint pens for all Volkswagen years and models. Order a Volkswagen paint pen for your vehicle by clicking your model above. Next select your Volkswagen year and color order your Volkswagen touch up paint pen. Drive a VW and need a Volkswagen touch up paint pen? You have come to the right place! We sell VW touch up paint pens for every Volkswagen going back to 1951. 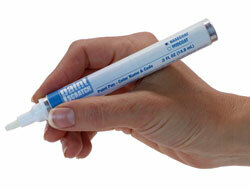 Yep, we've got a Silver Grey Volkswagen paint pen in our store for you 1951 Volkswagen Bus drivers. Drive a newer model like the Golf, Jetta, Passat, Tiguan, or Taureg? We've also got VW touch up paint pens available you too. We mix every Volkswagen touch up paint pen at the time of the order for the best match. In fact, we're so good at matching VW paint that we guarantee your Volkswagen touch up paint pen color will match the original factory color chip from your vehicle's manufacturer. Ready to order? Simply find your VW in the list on this page, select your year and color, and voila you'll have a Volkswagen touch up paint pen in your hands in a matter of days!